With the Drupal Commerce 2.0 release slated for September 20th, we are making an effort to provide excellent documentation so that our implementers and end users can work with Drupal Commerce efficiently. We also want to encourage contribution at all levels, such as documentation. I am happy to announce we have moved from using Sphinx, a Restructured Text documentation tool, to GravCMS. GravCMS is a PHP based flat-file CMS, which uses Markdown. Contributors had to adjust to Restructured Text, which is kind of like Markdown but not completely. It required a build script. After community feedback, it became apparent we needed to find a better solution. Documentation is as crucial a contribution as the code. A community member, yaazkal, suggested using GravCMS. After initial review and community feedback, the platform migration began, and is now complete! Initially, the documentation was using GitBook. GitBook allowed us to use Markdown and have structured content. GitBook had a rough time handling 404 errors, and we had general structure errors. We then reviewed Sphinx. Sphinx is the documentation tool that Symfony uses; and, Platform.sh also hosts Symfony's documentation just like our own. It seemed like a great fit because we could control the theming, have the robust markup of Restructured Text and still allow contributions through GitHub's user interface. GravCMS gives us everything in our requirements. It is easy to run locally: use PHP's built in server. Easy to contribute: Markdown, automatic menu generation. When tied with our Platform.sh hosting this creates a very welcoming contributor experience. With each proposed change, Platform.sh environments are created for each pull request, allowing to live review of each change. With an improved platform, it is also time for more changes to our documentation. To provide best in class documentation, we have implemented a new outline for content. 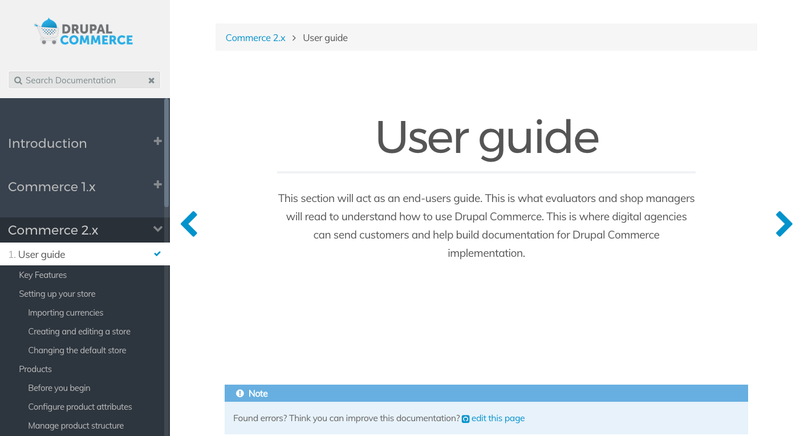 The Drupal Commerce documentation is now split into a User Guide and a Developer Guide to match the two audiences who need documentation. User guide: This section acts as an end-users guide. This guide is what evaluators and shop managers will read to understand how to use Drupal Commerce. This guide is where digital agencies can send customers and help build documentation for Drupal Commerce implementation. Check out our newly updated documentation at https://docs.drupalcommerce.org and feel free to begin contributing!